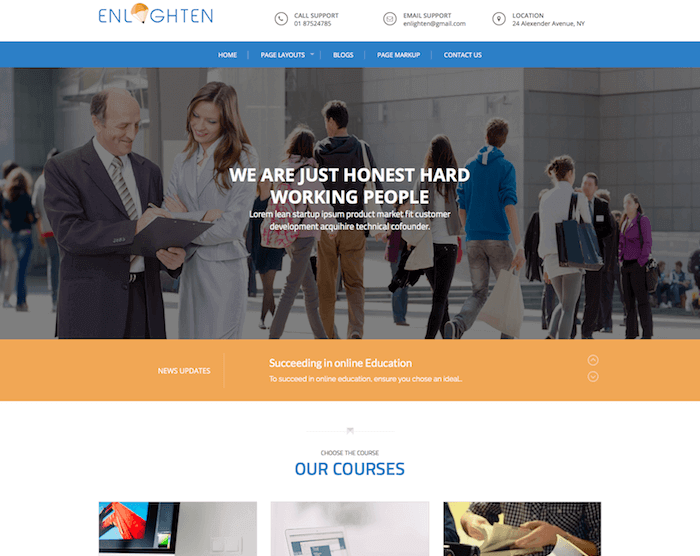 Enlighten is a free, one page WordPress theme designed specifically for education related websites. Wondering what makes Enlighten so special for education niche? Well, here is your answer. Enlighten theme has been designed to be ideal for any education website. The theme comes equipped with several features and functionalities that make it ready to build an academic website. It features a beautiful design where the homepage contains almost every information you might need from the website, such as course details, about us, success story, students, teachers, video, testimonial, FAQs, latest news slide, message board, and more. In addition to that, the theme also consists of the blog page and some other important pages. Apart from the educational sites, Enlighten theme is also sometimes used by businesses and professionals. Enlighten features a beautiful news section right at the homepage of the theme. The section displays the latest news and updates from your blog so that your readers can receive the news highlights without even needing to visit the blog. The news slide section comes with the customizer tool that can be used to make design and layout changes in the specific section. Enlighten theme homepage features a stunning full-width slider that can contain the best of your website. The slider can hold multiple slides containing images, text, and/or links. There is also a section for news updates right below the homepage slider. This section fetches and shows some news and updates from your website blog. These sections can also be easily customized and optimized with the use of built-in WordPress Customizer. Enlighten theme is fully responsive and can easily adapt itself to any platform and device. All the components in the theme are easily adaptable to every screen size. Enlighten has been designed to feature some of the coolest design parameters, such as custom header, two menu styles, multiple page layouts, blog design, attractive gallery image effects, grid view, and many more. Enlighten customizer allows you to easily customize almost every setting of this theme with live previews. Enlighten is a perfect theme for creating school, coaching, tuition, college, university, or any other academic website, and is also sometimes used for building other general websites and blogs.